Petra is one of the places you want to visit before you die. It is really unique and breathtaking, specially the moment you see the Treasury. 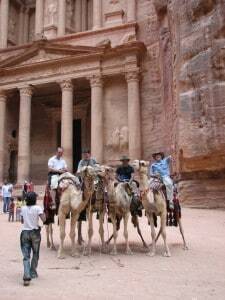 It is highly recommended to visit Petra once you visit Israel. The best way to visit Petra is to fly into Israel and then return from Amman Jordan back home; all major airlines can provide flights. From Eilat it is possible to do 1 day round trip to Petra and with a private tour possible to squeeze Wadi Rumm as well. Wadi Rumm worst visiting. From Israel to Jordan we have 3 border crossing – King Hussein bridge (previously Allenby) . this border crossing is the closest to Amman but you need to obtain a visa in advance. Israelis are not allowed to cross her as per the peace agreement. Yitzhak Rabin border crossing next to Eilat. We prefer to cross through Arava next to Eilat visit Aqaba – Wadi Rumm – Petra – over night in Petra and then next day drive to Jordan valley border crossing it is a full day drive but quite interesting. If you have enough time it is possible to visit the sites along the Kings highway – Karack – Madaba – Mt. Nebo and Jaresh. The border crossing with an Israeli car is a bit more complicated and quite costly but it is the best way to do it. Amman like Tel Aviv big cities lots of traffic night life but you can skip both of them.